Laying drywalls and other materials is an exhausting process especially if you try to do it by hand and you have an entire house to cover. There are so many screws to put in and while you can use a regular drill. With their variable speeds, more often you will just end up tearing and ruining the drywall paper. For this reason, a drywall screw gun can come in quite handy, especially if you need to put in so many screws. They are light and compact built for nothing else but driving screws into drywalls with utmost speed and precision (Source). 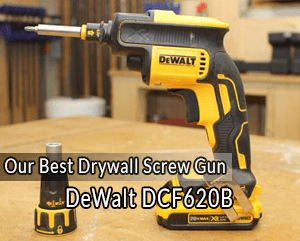 So, if you often have large projects that involve putting in a lot of screws, you need to invest in the best drywall screw gun. A durable and reliable gun that’s easy to use and can provide years of service. There are so many good options on the market. However, in this review we’re a going to focus on the best five models you can find out there. These screw guns are well-built, powerful, and easier to use. Just like drywall sanders, they can save you valuable time and money. Topping our list is none other than the DEWALT DCF620B model. Compared to the other four guns we’ve reviewed. This is the most well-balanced unit. It’s powerful, fast and ergonomically designed making it the best all-round screw gun for hanging drywall on the market. The motor on this unit is brushless with durable steel parts which mean it will endure a lot of hard use and will not break down easily. Combined with the smooth-transitioning gear system, the motor delivers superior performance and optimum run time. It provides up to 4,400 rpm which is sufficient torque to drive the screws lightning fast allowing you to accomplish your tasks quickly. The nosepiece located on the front is quite easy to adjust and delivers consistent screw depth throughout once you set it. It also features a locking system that’s very responsive and locks on securely. So you never get an accidental shift while working. As far as usability is concerned, the unit is light and has a soft and ergonomic handle that facilitates a comfortable yet firm grip. Therefore, you will experience less fatigue when working for long hours. The clip is also well-positioned on the side of the gun where you can hang it on a belt or pocket to facilitate quick and easy reach. 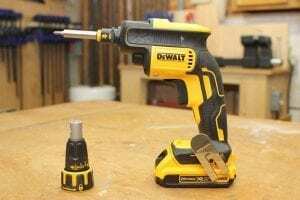 Unlike most cordless models, DEWALT DCF620B is designed to hold a charge for quite a long time hence it will deliver consistent power for hours when fully charged. The only setback is that you have to purchase the battery separately as it doesn’t come with its own battery. However, it’s equipped with LED light which is especially handy when you are operating in dark, tight spaces plus it’s very quiet. Generally, the DCF620B is a powerful screw gun that can efficiently work with both small and huge screws. If you are in search of a top-rated gun that can handle light, medium as well as heavy-duty drywall installation jobs, then this is an option you might want to consider. Makita is a well-respected brand and their XSF03Z model not only takes the second position on our list but also stands out as the best cordless screw gun. 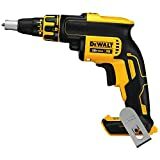 If you conduct drywall installation on a regular basis and you are looking for a versatile and powerful cordless gun that can help you get the job done quickly and efficiently, then you should check out this unit. To start off, it has a sturdy, tough body designed to withstand harsh job site conditions and heavy use. The cast aluminium gear housing, clutch and spindle are all much more robust and less prone to wear and tear. The unit is solidly built for long lasting service delivery and even utilizes the Extreme Protection Technology (XPT) to keep dust and water at bay. Despite its tough construction, handling and operating this Makita screw gun is a breeze. Its compact, lightweight and the soft grip handle fits comfortably in the hand. So you can use the unit for hours and it won’t wear your hand down. As far as performance is concerned, the XSF03Z is up to the task. It has a durable brushless motor that generates sufficient power and speed to screw into some of the toughest materials with minimal effort. The motor delivers up to 4000 rpm making operations quick and effective. 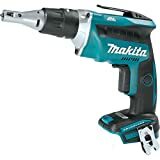 The push drive mechanism is another area where this Makita drywall screw gun shines. It’s so quiet and allows the machine to place in screws with just the right depth. You can as well adjust the nosepiece to ensure a consistent screw depth. The best part of this push drive technology is that it helps save the battery life. The motor only starts running when you engage the fastener, so you don’t get to waste any energy. Therefore, the battery will last longer than in other ordinary drywall guns. Like the DEWALT DCF620B, this too does not come with a battery. So you will have to get it separately. However, it features a battery charge indicator which is quite a thoughtful addition as you get to know when you need to swap it out. Overall, the Makita XSF03Z is the best cordless drywall screw gun you can invest in. It’s well-made, powerful, fast and comfortable. 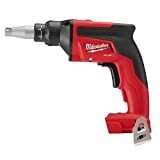 This is a solid choice for anyone looking for the ultimate cordless screw gun for hanging drywall and other materials. Perfect for drywall installation but you can have a bit of a hard time with the other materials. When it comes to corded screw guns for drywall installation, few models can match up with Senco DS332 gun. This is a heavy-duty machine meant for large scopes of work. If you are on the market searching for the best corded drywall screw gun, then this is an option worth considering. The unit is equipped with a durable 6A variable speed motor that can deliver up to 2,500 rpm. It does not have the highest speed and torque on this list but it’s fast enough and just as accurate as the other four guns. One feature that stands out on this Senco corded gun is its auto-feed function. Instead of using bands of screws like an old school machine gun, this unit utilizes a corner fit feed system which works even much better. The belt feeder can hold up to thirty screws upon which they move up automatically while you are working. The unit significantly increases your productivity levels much more than other ordinary guns. However, inserting the screws initially might take a little while but once you get it you are as good as done. The gun also allows you to set depth so you get to have precise depth when driving screws. The hand is comfortable and ergonomically shaped. It provides a firm and reliable grip preventing the machine from slipping out of the hand. Having a firm, robust body with well-built parts, this gun will serve you for quite a long time before you think of a replacement. 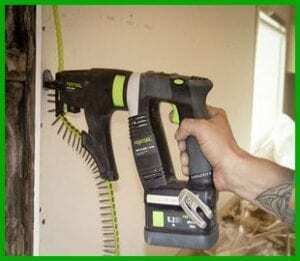 For those in the market for the best corded screw gun for those heavy drywall installation projects, then the Senco DS332 is definitely worth your attention. The Milwaukee 2866-20 M18 is a sturdy and efficient cordless screw gun that strikes a great balance between power and productivity. If you are looking for a unit that can offer optimum performance throughout no matter the size of the job, then the Milwaukee M18 is a good choice for you. The brushless motor of this unit delivers 4,500 rpm which is the highest on our list. This means that you get up to three times longer run time compared to regular cordless guns which result in faster productivity. So, you will be able to cover a lot of area within a short time provided you also get a good battery. The auto start function is not only convenient but also saves the engine from wear and tear. When turned on, the motor will only run when the bit makes contact with the drywall. It starts automatically and stops when the contact is broken. It will save you hours of battery life and a bit of sanity from all the constant whine of drywall gun running constantly. You will also appreciate its lightweight and ergonomic grip. It’s well-balanced in the hand as well as on the belt and the handle is soft. It fits snuggly in the palm and feels really comfortable. You won’t experience much fatigue when using it for prolonged hours. The depth settings are easily adjustable and inserting the screws is effortless. The only downside like the other two cordless models above is that the battery is not included. You will have to get it separately. The LD120VA model from BLACK+DECKER closes our top five selection of the best drywall screw guns. While it’s not the lightest or the most powerful unit on our list, the LD120VA is a fantastic yet effective little screw gun that’s quite budget friendly. Despite weighing around 4.06 pounds, you won’t feel much exhausted using this machine. Its compact design combined with the soft-grip handle makes it comfortable to hold it for long hours without feeling fatigued. At 650 rpm, the motor of this unit is not the fastest either but it’s very capable of delivering sufficient torque to precisely drive screws in. It’s well built and has enough power to handle light activities particularly drywall mounting. Plus, the fact that it’s compact makes it more flexible allowing you to easily access tight spaces. Its 24 position clutch, on the other hand, offers an extra level of control as you get to select the settings that will deliver great precision when doing screw-driving tasks. The unit comes with a 20-volt lithium-ion battery which holds up pretty well. This is the only cordless gun that has a battery included in the package and that’s a thump up. 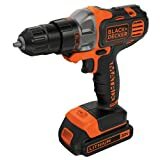 To sum it all, the BLACK+DECKER LD120VA is definitely not designed for heavy duty jobs but if your work involves primarily dealing with drywall and you are under budget, then this might be a good option for you. When looking for a drywall screw gun, there are some key things you need to keep an eye on to make sure you end up picking the best gun for your money. These are the main things you should consider. You have to first know the type of screw gun you want before you even start shopping for one. There are two main options to choose from, that is, cordless or corded. The cordless guns are very convenient as you are not tethered to a cord that limits your movement. You will also be able to easily get into tight spaces with a cordless gun. However, the fact that they use batteries makes them a bit heavy and they are susceptible to battery related issue although not often. While not as convenient as the cordless units, corded screw guns are much lighter and you won’t have to worry about a battery dying on you halfway through a job. They also offer more torque and speed. Generally, there is no much difference between the two types. It’s a matter of personal preference. But if your work often involves putting in a lot of screws, then a cordless gun is a good option as it will give you the freedom to move around and perform overhead tasks with much ease. The motor is one of the most important things in a screw gun. It’s what determines the torque and rotation speed of your unit. So it will greatly influence the capability of the gun to drive screws. You want to pick a unit with a motor that’s sturdy and powerful enough for the type of project you will be doing. In this case, you should go with brushless motors. They are not only very efficient but can also last you a lifetime. If you are considering the corded models, you should check the motor’s amperage. The higher it is, the more potent and faster the unit. On the other hand, for cordless models, you should consider the capacity of their batteries as well as the specified voltage. The higher the battery voltage of the unit the more powerful the electric motor onboard. Plus, checking the battery capacity which is denoted in ampere-hours will tell you how long a unit is able to operate on a single charge. So, these are two main things you need to consider when evaluating the motors of various cordless screw guns. The main purpose of using a screw gun during drywall installation is because the depth of the screw is very important. If it’s too deep, then you end ruining the paper surface and if it’s shallow then the installation won’t be that firm. In other words, being able to set the depth at which the screw should sink into the drywall and stop at the right place each time is absolutely necessary. Therefore, you should consider a unit that allows you to easily and quickly adjust the depth of the screw. It should also have a special collar to ensure that when it reaches the depth you’ve set, the driving motion stops. With these features in place, you will be able to carry out your installations without ever having to worry about damaging the drywall. Considering that you are often going to use the screw gun for long hours, you want to pick a unit that’s not only easy to use but also comfortable. This will largely depend on the design and the ergonomics of the screw driving unit. 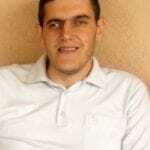 The following are some of the things you should consider when it comes to usability and comfort. The handles should be fairly thick with finger grooves or indentations along their top edges. Check also the availability of rubber pads along the handles. The grooves in combination with the rubber pads will make it easier to hold onto the gun hence providing a firm and comfortable grip. The weight of the unit is something that will also affect the usability of a screw gun. You want to pick a unit that’s lightweight so that you don’t get quickly exhausted before completing the work. Look for weight ranging from 2 to 5 pounds. Anything above that will be heavy. As we mentioned earlier, cordless guns tend to be a bit heavier due to the batteries. Therefore, this is something you want to factor in since most models don’t come with batteries. The weight might be higher than the one listed on the product specifications. Working in close quarters such as inside corners can be quite hectic. To ensure you have an easier time when working in such tight areas, look for guns that have either retractable or removable clips. Being able to pull the clip back or remove it can help save some room allowing you to set screws along inside corners without straining. Another thing you want to look at is whether or not the unit you are considering features a LED light. This might seem like a small factor but can actually come in handy especially when you are working in poorly lit places. So, it’s equally very useful to have. To sum it all up, when you are out and about in search of a screw gun, keeping all he above factors in mind will help set you on the right track and enable you to evaluate and pick out the best model for the kind of job you work on. Screw guns are some of the best tools that can significantly help when installing sheets of drywall. They are fast and accurate and as such really speeds up the job. While you can go with either the cordless or the corded option, we recommend highly taking the factors listed above under consideration as well as your particular needs before moving forward to purchase a gun. There are a lot of great options out there but if you want quality, performance and tougher units, then you might want to consider the five options we’ve listed above.